Designed for 413-426-440 c.i.d. Chrysler V8s. Use with Performer-Plus cam #350-2192 for low-end torque or Performer RPM cam 350-7194 for top-end power. Manifold measures 8.75'' across block. Manifold Height: (A) 4.45" , (B) 4.88"
Carb Pad Height: 4.66" Click here to determine carburetor pad height. 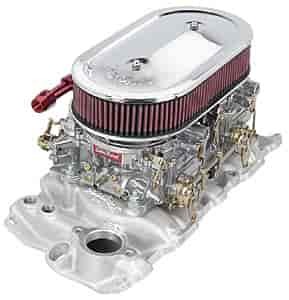 Port Exit Dimensions: 1.64" x 1.94"
The Edelbrock low-profile cast aluminum intake manifold and dual quad carburetor kits make it simple to change the appearance and performance of your induction system in a single box. These kits include the items needed to make installation fast and easy on your hot rod, muscle car or show car! Would you recommend using velocity stacks with this set up? I so what height? For street use we recommend using this air cleaner assembly, for drag racing the velocity stack will work well. This seems like it could possibly be a good match with the 284-484 purple shaft cam also. What are your thoughts and why? Yes, the purple shaft is similar to the Edelbrock performer camshaft so it should work well with the increased CFM available.